Statistics show that there are over 17,000 different airports all over the world. These airports bring people together, making both domestic and international travel so much easier than it was in the past and allowing people to visit many more destinations by air. Each airport has its own name and code, with the airport’s code being made up of just three letters. The airport code IAH is used for Washington Dulles International Airport. Where is Airport Code IAD? Airport code IAD, Washington Dulles International Airport, is located in Virginia. It stretches out across Loudon and Fairfax counties and is situated around 26 miles away from downtown Washington DC, making it one of the main airports for visiting DC. The address for airport code IAD (Washington Dulles International Airport) is 1 Saarinen Cir, Dulles, VA 20166. A contact phone number for this airport is 703 572 2700, with airport staff standing by to handle any queries or problems you might have. Airport IAD, Washington Dulles International Airport, was opened up in 1962. Before that time, Hoover Field was the primary airport for the DC area, but has since closed down. Washington National Airport, opened in 1941, became the main airport for DC, but a second major airport for the area was needed. It was President Eisenhower himself who selected the site where IAD would eventually be built. One of Eisenhower's trusted advisors, Pete Quesada, came up with the idea of naming the airport after John Foster Dulles, who was the Secretary of State under Eisenhower. From there, construction of the airport began in the late 1950s. IAD was originally called simply Dulles International Airport, but was modified to include 'Washington' in the early 1980s. The airport stands out for the unique beauty of its main terminal, which was actually designed by a renowned architect named Eero Saarinen. When IAH actually opened up, it wasn't a particularly popular airport. National Airport, which is now known as Ronald Reagan Washington National Airport, was running over six times as many flights as IAD, and since IAD was located some distance away from DC, passengers didn't really see the point in using it. Over time, however, the airport began to develop and become more popular. Dulles was the site of the first Pan Am Boeing 747 flight, with First Lady at the time, Pat Nixon, christening the aircraft. The first ever Boeing 777-200 flight also landed at Dulles, and the airport has been the site of various other aviation landmarks over the years. As time went by, the airport itself also saw some expansion, with the introduction of a train system called AeroTrain to help passengers get around and the creation of an underground tunnel system linking the main terminal and Concourse B was also opened. More development is planned for the future. Only a small number of airlines operated at IAD in the early days of this airport, but the list of airlines now contains dozens of different names. IAD is not quite as busy as Ronald Reagan Washington National Airport or Baltimore-Washington International Airport, but is still a major East Coast airport and covers around 13,000 acres of land. Over 20 million passengers are expected to fly through IAD each and every year, and the airport has more international traffic than any other airport in the Mid-Atlantic region, apart from those in the New York City area. IAD caters to around 90% of the international traffic for the Washington DC area. Around 60,000 passengers pass through IAD on a daily basis, with the airport serving over 125 unique destinations all over the globe, especially around Europe, Asia, and South America. The main domestic destinations from IAD are Denver, CO; Los Angeles, CA; San Francisco, CA; Atlanta, GA; and Orlando, FL. Meanwhile, the most popular international routes to and from IAD are London, United Kingdom; Frankfurt, Germany; Paris, France; Amsterdam, The Netherlands; and Tokyo, Japan. Parking at Dulles Airport is very easy. The airport features multiple lots and garages, with prices ranging from just $10 per day up to $30 per day or even $35 per day for the valet service. The smartest option for long-term parking stays at IAD is to use the Economy Lot, which charges just $10 per day. This lot is located furthest from the airport buildings but is the cheapest option. Getting to and from IAD is very simple. If you're traveling by car, you can use I-66 and I-495 to reach the airport by following the signs. If you're looking to use public transportation instead, there are multiple options. The airport is served by Washington Flyer Taxicabs, taking passengers to and from the airport and into DC or other local areas. There's also a shuttle bus that runs from the airport to DC and the Metro subway's Silver Line can be taken to the Wiehle-Reston East station. From there, a bus can be caught running right to the airport. IAD is a relatively simple airport to navigate. The airport consists of one major terminal building and two additional buildings: Concourse A/B and C/D. The airport traditionally used mobile lounges to transport passengers around and onto the aircraft, but this system has slowly been phased out and replaced by the more efficient and contemporary AeroTrain system and underground tunnels. The underground tunnels can help you get around by foot, while the AeroTrain transports passengers around from the main terminal building to Concourses A, B, and C, with plans for future expansion. IAD has its own hotel, the Washington Dulles Airport Marriott, which is located right on the grounds of the airport itself and offers free shuttle service to and from the main terminal building. 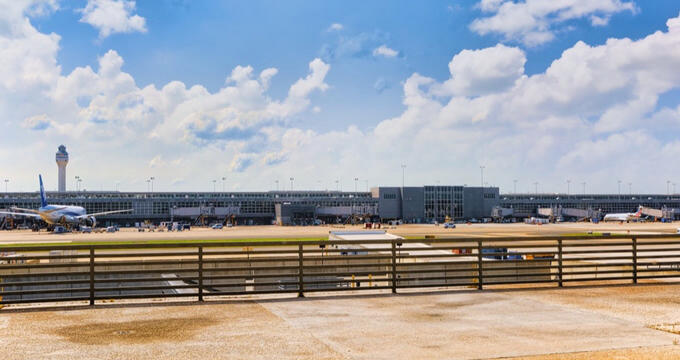 Fitted with casual, comfortable rooms and good amenities like indoor and outdoor pools, a business center, a restaurant, tennis courts, a gym, and more, this airport is one of the best options for people flying to and from IAD. The Washington Dulles Airport Marriott is located at 45020 Aviation Dr, Dulles, VA 20166 (703 471 9500).